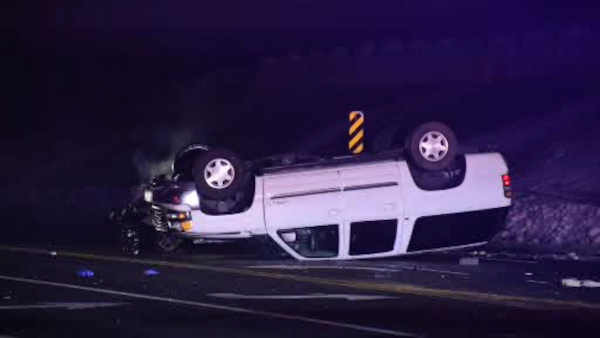 BOHEMIA, Long Island (WABC) -- A 16-year-old is charged with driving while intoxicated on Long Island after police say he led them on a drunken chase. According to Suffolk County Police, Thomas Barbella, of Bohemia, was driving a 2004 GMC southbound in the northbound lanes of Lakeland Avenue at approximately 12:23 a.m. Sunday. When an officer tried to initiate a traffic stop Barbella fled, authorities say. After a brief pursuit, Barbella crashed into a 2016 Ford Fusion at the intersection of Lakeland Avenue and the Sunrise Highway North Service Road. Barbella was traken to Stony Brook University Hospital in critical condition. The driver of the Ford Fusion, Breanna Gamaldi, 26, of Bohemia, was transported to Southside Hospital in Bay Shore with serious but non-life-threatening injuries. Barbella was charged with DWI with additional charges pending. He was issued a Field Appearance Ticket at the hospital for arraignment at a later date.